Casey Loe. “The Demon Whisperer”, Nintendo Power 251 (February 2010), pp. 70-72. Eiji Ishida has spent a decade summoning the demons of Atlus’s Shin Megami Tensei series, serving as the chief designer of Shin Megami Tensei: Nocturne and the two most recent chapters of its Devil Summoner spin-off series. Now, as director, he’s taken the helm of the newest installment—Shin Megami Tensei: Strange Journey for the Nintendo DS. NINTENDO POWER: In America, Shin Megami Tensei is better known for its spin-offs, such as the PlayStation Persona series. How would you explain to a Persona fan what makes the core Shin Megami Tensei series unique and interesting? 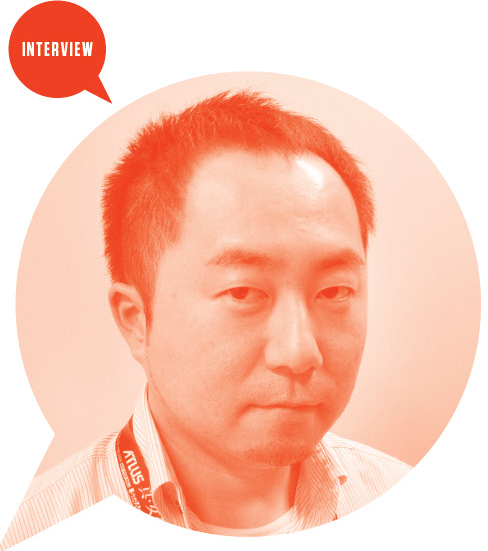 EIJI ISHIDA: All the titles in the series depict the extraordinary invading our ordinary lives, but the Persona series depicts the end of the world around the protagonist, whereas the main Shin Megami Tensei series depicts the end of the world itself. Also, whereas the Persona series revolves around everyday relationships with people such as friends and lovers, in the main Shin Megami Tensei series you deal with worlds that have fallen apart and godlike entities. The story of a mainline Shin Megami Tensei game tends to be more grand and apocalyptic. The Shin Megami Tensei series is about gaining the power necessary to survive in a dangerous and destructive world. It’s the methods of acquiring this power that give the main Shin Megami Tensei series its chief characteristics. One is the Demon Conversation system, in which you persuade enemy demons to become your allies and lend you their power. I think it’s close to picking someon [end p. 70] up in a bar, but here you’re dealing with inhuman beings, so it becomes much more complicated. There are times when they approach you kindly, then suddenly attack; or ask for money, then just take it and leave. (Maybe they’re not so different from humans after all?) 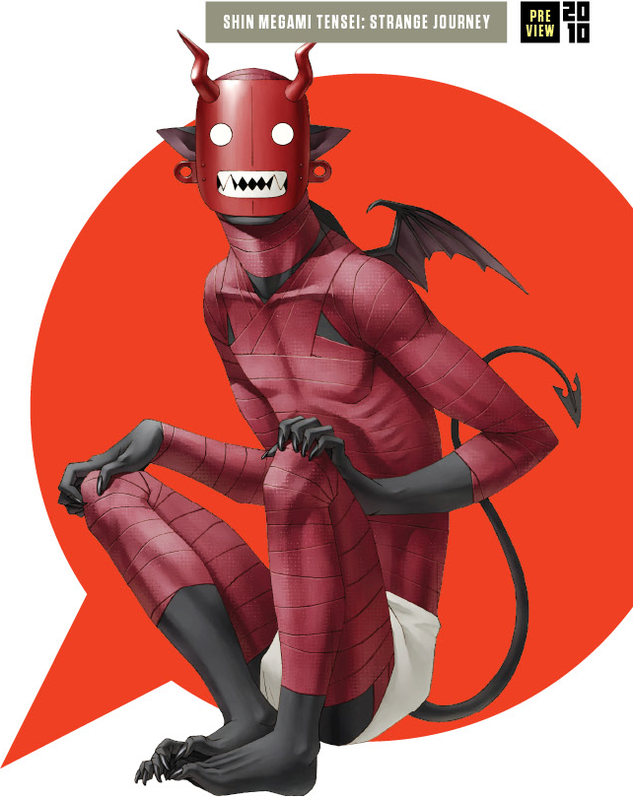 Communicating with these eccentric demons and negotiating with them is the fun part of Demon Conversation, and forms a good deal of the series’s flavor. The other part is Demon Fusion, where you use technology to fuse demons together and make a stronger demon. The newly born demon inherits the skills of the fused demons, so the player can use this system to create his or her own demon allies. That kind of customization is what makes the games so addictive. Why did you decide to set a Shin Megami Tensei game outside of Tokyo for the first time? And where else would you like to take the series in the future? In order to depict danger on a worldwide scale, we needed to select an appropriate setting. For that reason, we thought a place that people associate with the Earth itself would be better than Tokyo, so we chose Antarctica. Beyond that, I believe the movie The Thing was no small influence…. As for where I’d set future games in the main series, as long as it’s a good fit for the game’s theme and allows for a compelling premise, I’d be willing to try anything, even the inside of John Malkovich’s head. I’ve heard that you’re a fan of Western-developed games. What are some of your favorites? I’ve been fascinated with the dynamism of graphics and immersive game experience that many Western games have. Lately my favorites have been Fallout 3 and Left 4 Dead 2. Now that development is done, I’m living the good life and getting back into games, but my next project is already underway, so these salad days won’t last long. Have games like those had any influence on the development of Strange Journey? I think PC games I came across in my high-school days, like Drakkhen and Dungeon Master, made a big impression on me. Even then, I was fascinated with the immersive quality that sucked players into the game’s world, and I always strive to recreate that experience in my games. To what extent did you consider foreign audiences when developing Strange Journey? Given changes like moving the setting from Tokyo to Antarctica, the characters coming from all over the globe, and a heavier emphasis on the sci-fi aspects, you might think that we’re reaching out to the overseas market, but a lot of these changes are just the result of [executive producer] Kaneko’s and my tastes. Strange Journey has several cosmetic similarities to the Etrian Odyssey series. Do the two series have any staff in common, or use a common game engine? The game designers who handled the battle system and some of the programming staff are from Lancarse [a production company involved with the Etrian Odyssey games], and some aspects, like the game engine, are a customized version of Etrian’s. Beyond that, a lot of the people who worked on Strange Journey were familiar with the genre. Did the success of the Etrian Odyssey series influence your decision to make Strange Journey on the DS? Yes, you could say that. Etrian Odyssey proved that there are still plenty of DS owners who enjoy this genre. But there were other reasons we went with the DS, too. One is that it has the largest installed base within our target audience. Another reason is that we believe games where you take your time and play them into the ground-in other words, games that require a certain level of concentration-are best served on the DS. My take is that the relaxed feeling you get from knowing you can just quit whenever you want actually lets you focus longer and harder. Being able to dedicate the bottom screen to information was also a big plus.